The data that Homeland Security would share with Census officials would include noncitizens’ full names and addresses, birth dates and places, as well as Social Security numbers and highly sensitive alien registration numbers, according to a document signed by the Census Bureau and obtained by AP. Such a data dump would be apparently unprecedented and give the Census Bureau a view of immigrants’ citizenship status that is even more precise than what can be gathered in door-to-door canvassing, according to bureau research. Six former Census and DHS officials said they were not aware that individuals’ citizenship status had ever before been shared with the Census. “Generally, the information kept in a system of records is presumed to be private and can’t be released unless it fits with a certain set of defined exceptions,” said Leon Rodriguez, who led the DHS agency responsible for citizenship under the Obama administration. “All uses of the data are solely for statistical purposes, which by definition means that uses will not directly affect benefits or enforcement actions for any individual,” according to the 13-page document signed by a Census official. Amy O’Hara, who until 2017 directed Census Bureau efforts to expand data-sharing with other agencies, said she was surprised a plan was in the works for sharing alien numbers, which are assigned to immigrants seeking citizenship or involved in law enforcement action. Some prominent GOP lawmakers endorsed the citizenship question, saying it would lead to more accurate data, and a joint fundraising committee for Trump’s re-election campaign and the Republican National Committee used it as a fundraising tool. 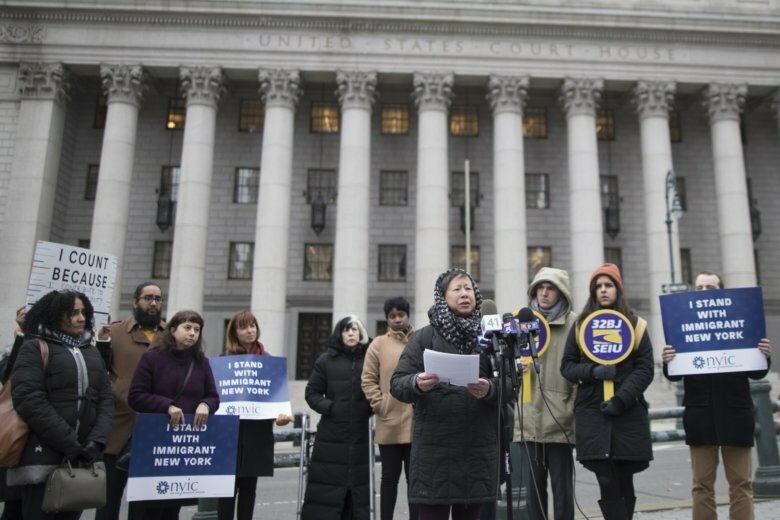 Immigrants’ rights groups and multiple Democratic-led states, cities and counties filed suit, arguing that the question sought to discourage the Census participation of minorities. Documents and testimony in a New York trial showed that Ross began pressing for a citizenship question soon after he became secretary in 2017, and that he consulted Steve Bannon, President Donald Trump’s former chief strategist, and then-Kansas Secretary of State Kris Kobach, a vocal advocate of tough immigration laws who also has advised the president. Emails showed that Ross himself had invited the Justice Department request to add the citizenship question. A March 2018 memo to Ross from the Census Bureau’s chief scientist says the DHS data on noncitizens could be used to help create a “comprehensive statistical reference list of current U.S. citizens.” The memo discusses how to create ‘baseline citizenship statistics’ by drawing on administrative records from DHS, the Social Security Administration, State Department and the Internal Revenue Service, in addition to including the citizenship question in the census. In January, New York federal judge Jesse Furman ruled that Ross was “arbitrary and capricious” in proposing the question. After Francis Cissna took over as director in October 2017, the agency initiated a “denaturalization task force” aimed at investigating whether immigrants obtaining their citizenship fraudulently. The agency also has slashed the refugee program to historic lows and proposed reinterpreting immigration law to screen whether legal immigrants are likely to draw on the public welfare system.